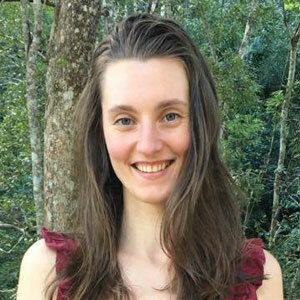 Kate is a Embodiment & Pleasure Coach and Yoni Mapping Therapist based in Perth, where she lives in a tiny house that she built with her partner. She is passionate about empowering others and runs regular events bringing women to meet the most intimate parts of themselves in a gentle and nurturing environment. Kate is inspired by all things woman. The profound intelligence that lies within every woman’s body, how closely we are related to nature in our pure essence and how delicate yet powerful we are, designed as the birthplace of life itself. Our ability as women to transform pain into pleasure is something that regularly leaves Kate in awe. Kate is sometimes challenged by her tendency to over commit to all her amazing ideas. However, because of this she has developed an almost superhuman ability to get anything done – fast! Kate is an all or nothing kind of girl, blogging to the world about her yoni in one moment and hiding under a blanket the next. She also hates public speaking. With her heart warming ability to make anyone feel comfortable around her, Kate uses her humour as medicine to shift darkness and heaviness into light and understanding. “Today I had my second yoni mapping therapy with Kate Atkinson. I learnt more about the different nerves and zones and the sensations available to me. It was even better the second time because I had become more familiar with the intentions and what course it would take. The best part for me was the feeling of complete safety, acceptance and guidance to unwind and unravel what needs to be seen and acknowledged to heal. The experience Kate took me on this time especially helped guide me back to connection, respect and amazement for this core part of who I am and how I relate to my world. I highly recommend this experience to be of benefit to woman from all walks of life. The change in perspective about what makes our bodies beautiful and deserving of pleasure is changing our world for the better. The hidden strengths we uncover through this discovery makes sense to why there has been such extremes throughout history and still in cultures today suppressing this natural and powerful inner resource we have always had. I left with a euphoric sense of floating and being grounded at the same time.